Chrysler will introduce a 1.4-liter gasoline engine in the Fiat 500 in the fourth quarter of 2010. DETROIT -- During the next five years, Chrysler Group's powertrain lineup will be transformed from one dominated by larger-displacement engines to one dominated by Fiat-derived four-cylinder engines, V-6s and, eventually, electric vehicles. Chrysler also said today that it will add Fiat-designed dual-clutch transmissions in its North American products. The company also will launch its new Pentastar V-6 engine on the 2011 Jeep Grand Cherokee in the second quarter next year, said Paolo Ferrero, Chrysler's powertrain chief. The Pentastar will replace all Chrysler's V-6 engines, from 2.7-liter to 4.0-liter displacement. The first dual-clutch transmission will appear on a new D-segment vehicle at the end of 2010. Also about that time, Chrysler will launch stop-start technology on the Jeep Wrangler diesel, an existing vehicle in Europe. The combined Chrysler-Fiat companies will divide into centers of powertrain expertise. Fiat will produce small gasoline engines and diesels, while Chrysler will be the center of knowledge for V-6s and V-8s. Chrysler was not clear on when, or whether, Fiat diesels will come into the North American lineup. Chrysler's current engines gradually will give way to a new mix dominated by four-cylinder engines and the new V-6. In 2010, Chrysler's legacy engines -- those in the stable before Fiat took control -- will account for 84 percent of Chrysler's engine mix. By 2014, the legacy engines will be down to 12 percent. In 2014, Fiat-derived engines will account for 42 percent of Chrysler's mix. The Pentastar V-6, developed before Fiat came on the scene, will account for 38 percent. 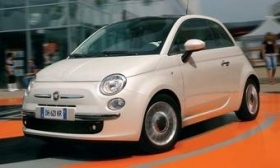 • Introduce a 1.4-liter gasoline engine in the Fiat 500 in the fourth quarter of 2010. • Launch a turbocharged version of the 1.4-liter four-cylinder in the fourth quarter of 2011. • Apply Fiat technology to Chrysler's Pentastar V-6 -- including MultiAir, which Fiat says improves fuel economy 10 percent by using electrohydraulic valve controls to adjust the air and valve timing for each cylinder. Single and twin turbocharging also will be used. • Apply Fiat fuel-saving technologies to engines it purchases from outside suppliers, such as the Cummins diesel. • Continue development of hybrid electric vehicles, including the launch of the Dodge Ram 1500 hybrid electric truck, due out in 2010 as a 2011 model.